Why do I need a curved screen? If you believe the official website of Samsung, it increases the field of view, reduces the load on his eyes, and in general these screens will visually appear larger than flat. That is the real benefit of curved displays should be. Like it or not – we will check in the “Testing”, and yet continue our little story about the “bent” screens. As is the case with television, models with curved screens will produce not only Samsung. For example, the monitor LG 34UC97 with a curved 34-inch screen with an aspect ratio of 21: 9 (3440×1440 pixels) is soon to go on sale in Russia. Also at Computex 2014 its curved display shown by ASUS. This display was more familiar aspect ratio – 16: 9 diagonal was 32 inches, and resolution – 2560h1440 pixels. That’s just the start of sales of the curved monitor from ASUS yet almost nothing is known. However, it is sold only Samsung – they are going to do. Curved Samsung S27D590CS comes in a flat, painted box. Like many other monitors Samsung, packaging device turned out to be surprisingly compact. 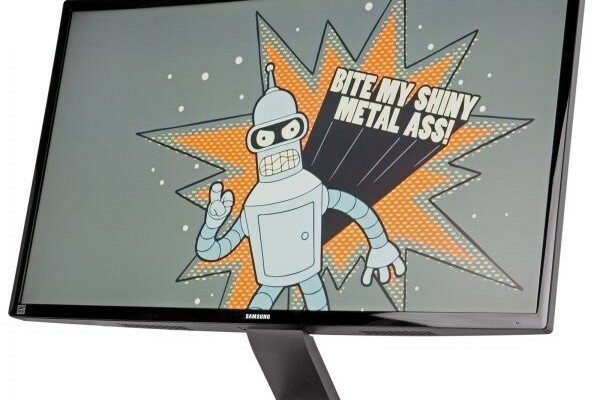 Diagonal matte screen Samsung S27D590CS is 27 inches, and resolution – 1920×1080 pixels. As a result, the calculated value of PPI turned modest: 81.59 pixels per inch. 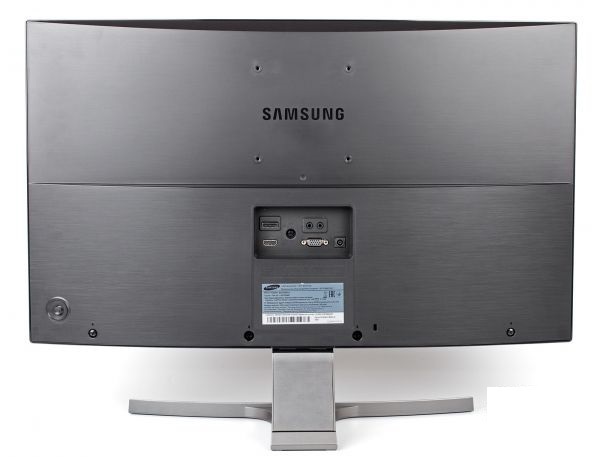 Model matrix of the first curved monitor Samsung we could not be determined – this information on your site does not publish any manufacturer. Even in the service menu Samsung S27D590CS manufacturer did not disclose his secret. It is known that our experimental matrix is of the type * VA, but its precise subtype – PVA or MVA – Online Samsung Unknown. The maximum brightness of the screen on the official website of the Russian for some reason not given, although the English version, we found out that it should reach 300 cd / m2. This is good, and nothing to be ashamed of here. The static contrast ratio is an impressive 3000: 1, and the exact value of dynamic contrast is hiding under the pseudonym Mega ∞ DCR. Judging by the fact that the display is capable of displaying 16.7 million colors in it has either 8-bit matrix or 6-bit, supplemented by technology FRC. As for the other parameters, with the refresh rate of the screen it should be no problem: the average response time (GtG) is 4 ms. With viewing angles of the hero of this article, too, everything is good, the specifications were given 178 degrees vertically and horizontally. Among the curved screen TVs no longer considered exotic, although such models are still a lot – from forty thousand and above. With Monitor, fortunately, things are different. The hero of this article – one of the first curved screens available on the market, and, unlike similar televisions, at the time of publication of this article, it cost about 18 thousand rubles. 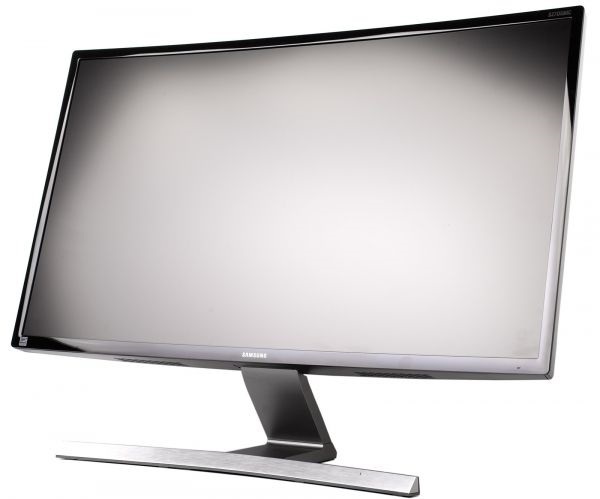 Samsung S27D590CS very similar to another monitor Korean giant, Samsung S24D590P. Both screens are in the same style and overall color scheme, except that the hero of this article bent. Coincidence is not accidental: these two displays are from the same series. The radius of curvature of the screen at the time of this writing, the official Russian Samsung website has not been specified. But the English site in the specifications found traces Display Type: VA (Curved 4000R). It is likely that the 4000R alludes to the radius of curvature given in millimeters. 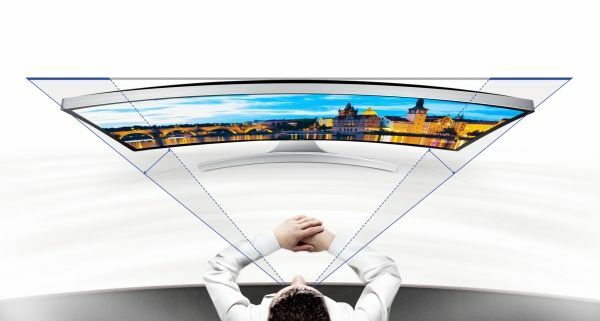 If so, then the radius of curvature of the screen Samsung S27D590CS equals four meters. Recall that the screen on Samsung UE65HU9000T – TV with 65-inch curved screen – was similar to the radius of curvature: 4.2 meters. However, the screen size is the hero of this article is almost 2.5 times lower than that of the above-mentioned TV, so if you look at our experimental front, its curvature and can not see. But when you look at the screen Samsung S27D590CS little oversight from above bending impossible. On the front of the monitor there are no controls other than a lone indicator work. As before, the only button joystick located on the rear panel in the lower left corner. Or, when viewed from the front of the monitor, the right bottom corner. In the center of the rear panel contains all video inputs Samsung S27D590CS. Their little: DisplayPort, HDMI and D-Sub, – of course, there is not enough connector DVI-D, but this set of ports enough for all occasions. For audio input and output of the display there are two 3.5mm audio jacks located next to the video inputs. On the left and right sides of the Samsung S27D590CS no ports and connectors. But on the bottom, you can find two speakers are hidden inside the body. Stand at the monitor is quite simple – it is bent and removable. Here are just attached it to the hero of this article is only due to the forces of friction and gravity. Therefore, an attempt to move the monitor from one table to another, if you take it for the stand and tilt the screen down, can result in very sad. Alas, in the Samsung S27D590CS, as in many monitors the Korean company, implemented such a system, attaching the stand. Among other things, the silver coating on the leg stand was very thin, scratch it can even accidentally – for example, on the edge of the metal shell wireless keyboard. But with the stability of the hero of this article all is well on the table our main guinea stands firmly and thoroughly. Height adjustment at the monitor does not. The only thing that is available to the user, is the slope of -2 degrees (forward) to 20 degrees (back). Samsung S27D590CS menu is typical for all monitors company. It is simple and logical, and for each item has its own description, so it is impossible to get confused. The first menu item is devoted to basic picture settings. You can change the brightness, contrast and other settings of the monitor, as well as enable or disable the proprietary features Samsung. For example, change the mode of Magic Bright (options affect the brightness and contrast of the monitor depending on the image on the screen) and Magic Upscale (improve image clarity in low resolution). Also in this menu you can set the black level of HDMI and job functions Overdrive. The second paragraph contains more fine-grained image. Here you can tweak the color from the palette RGB, change the hue (color temperature), and gamma. The other three points are typical and are found on all displays. They can customize the onscreen menu to change other settings, monitor and view information about the connection. 2 batteries, Windows 10, 3 ports, with and without keyboard, with digital pen, front and rear cameras… HP Elite x2 – dream or reality?